The train, approaching the crossing at high speed, crashes into the trailer truck. The terrifying moment an oncoming train crashed into a trailer truck stuck on a railway track has been caught on camera. Two different videos of the incident show the collision and the impact of the crash on the trailer, which was reduced to a pile of rubble in the accident. Luckily, no one was hurt in the incident, according to reports. 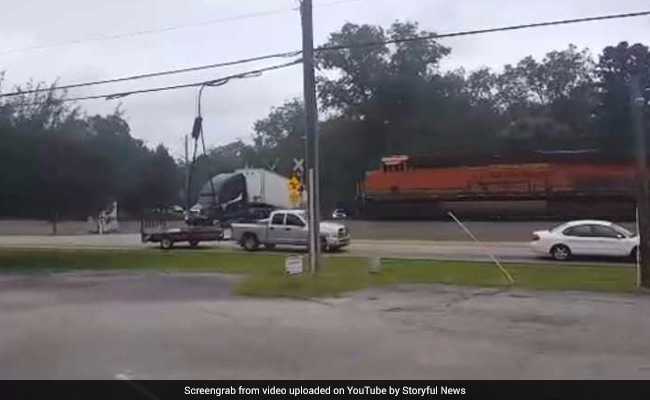 The videos, one 51-seconds-long and the other 18-seconds-long, show the truck standing on the tracks at a railway crossing in Atlanta in Georgia, US. Seconds into the video, the train can be seen approaching the crossing at high speed. It is then seen crashing into the trailer and continuing forward. While the trailer looks completely destroyed, you can see the contents it was carrying spread on the ground. According to WSB-TV, locals see trailers stuck at the crossing often. "I wish the truck drivers would read the signs," Maryann Morfoot, who lives in the area, told WSB-TV. "Our fear is always that something on a train would be dangerous, and there's no way for us to get out. Luckily, this time it was just candy. I'm glad it was just candy." The tracks were eventually cleared for trains to pass. The police will cite the driver for the incident, reports WSB-TV.